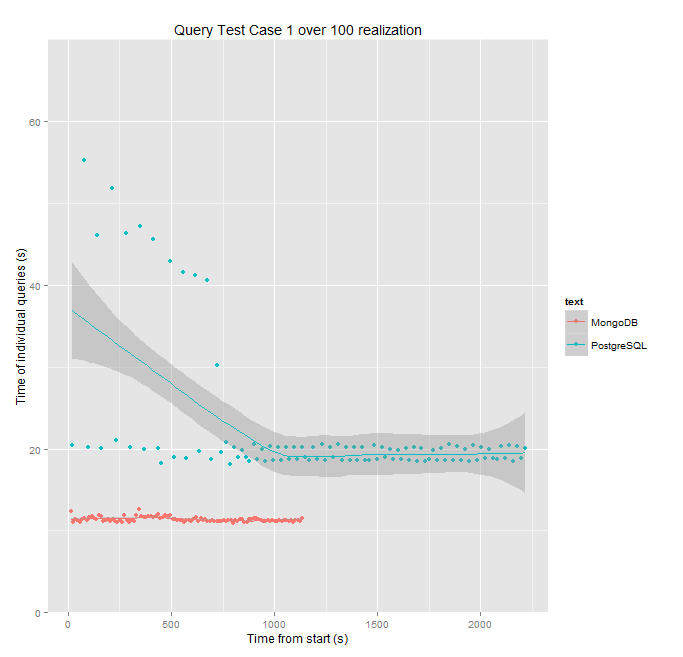 MongoDB – PostgreSQL speed comparison | Spatial stuff for everyone! 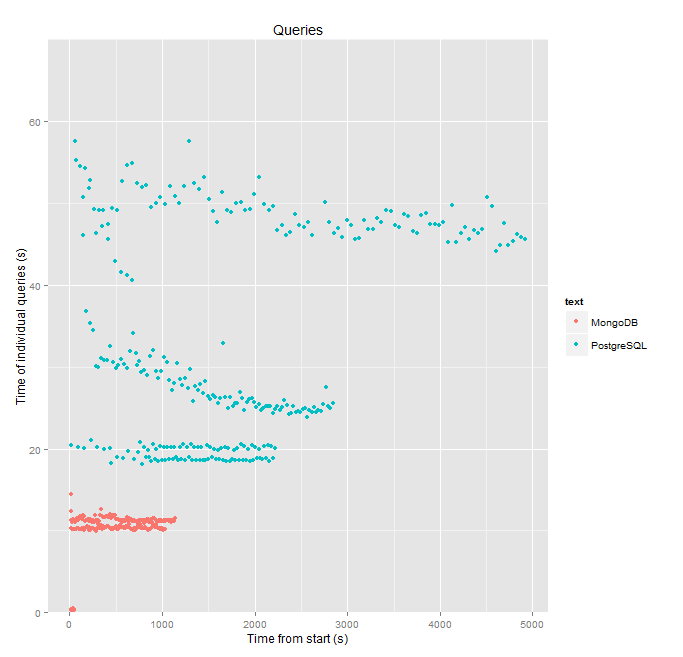 If a MongoDb collection and a Postgre table contain similar (or identical) data then a comparison in terms of speed would make sense. 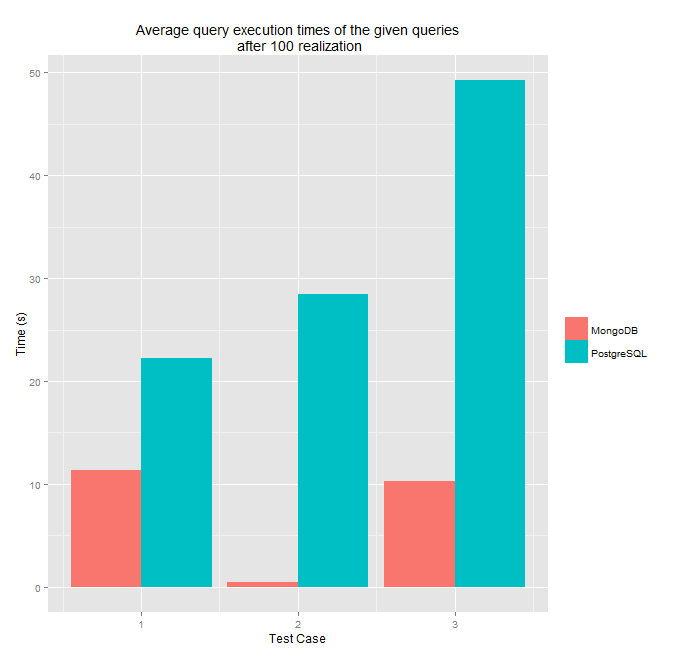 I wrote a python script which measures query execution times both in Postgre and MongoDB an then creates arrays of the execution time of each individual query. The script runs every query 100 times after each other. The script access the databases by using two python APIs, PyMongo for Mongo and psycopg2 for PostgreSQL. In this case, these times will represent initial results, because both DBs and queries should be optimized with appropriate, indexed fields. Queries will result cursors, so the script will iterate through them and call a method named do_nothing() which literally does nothing but returns with no value. Our first query should represent a case where we want to grab all the documents and rows from the DBs. We pass None as a query paramter for the find() method, and also a script will limit results to 100000 on the mongo collection. As for Postgre, we pass “SELECT * FROM table LIMIT 100000”. 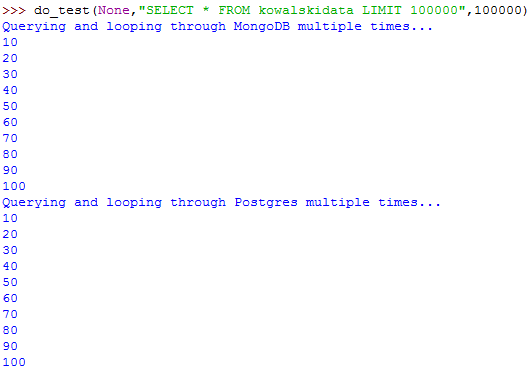 Once tests are finished, we have 2 lists named mongotimes and pgtimes each with 100 entries representing the execution times of each query over 100 realization. Let’s write them to file and import them to R in order to create some nice plots. 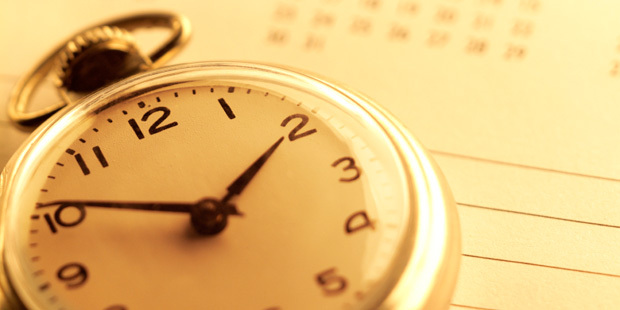 Now, we have to import the times to R and see what we can do with it. We will use ggplot2 package to create nice looking plots and since ggplot2 works well with data frames, we have to create them first. We won’t write a script for this part. We will work with the R shell. First, we import the text files that we have just written out to file from Python (file names are different here, because I did not want to rerun tests, so I used the old ones). Then we fill a data frame with the time like this. One can make a lot of plots while playing with ggplot2 in R. Here are some other results from the same dataset. I’m not going into details about how to analyze these plots. You can use your imagination but it is clear that using MongoDB was much faster in this case. Also, you can notice a bigger range of the execution times of Postgre. Of course, these were the simplest queries possible but sometimes you just want to get what you’ve put into the DB. If you want to get the documents that you’ve put into the DB and there’s no need for joins and other stuff like that you should really consider using a NoSQL solution.